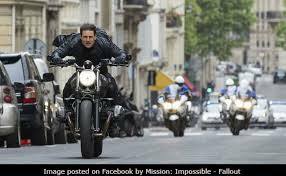 I made an exception not too long ago for the recent Mission Impossible entry, starring a 54 year-old Tom Cruise, who is ageing well, and can still project to some extent the charisma of his youth. He also did all of his own stunts, including flying a helicopter (for which he had to take months of lessons) and jumping across a chasm between two buildings (breaking his ankle, requiring a six month delay in filming, increasing the cost of production astronomically). But…Well, I will first reminisce along the lines of Saint Paul: When I was a child, well before the age of the computer and internet, my brothers and I would play ‘GI Joes’, where we would take our army figures and just make stuff up: GI Joe swinging from a building, beating up a dozen ‘bad guys’, doing somersaults, whatever our childish imaginations could conjure. This movie is a lot like playing GI Joes. In the end, however, I had to ask myself, all this mayhem for what? As the cast on the final Seinfeld episode admitted, if one’s memory goes back that far, all of their shows had really been about ‘nothing’, which was not quite true, but could truly be said of most modern franchise films. Now, I don’t ask for much in such action adventures. But I do ask for some realism in the ‘bad guys’; some basic dialogue that moves the plot forward; some tension and drama between the characters and the situations in which they find themselves. What we have here for the baddies are various incoherent ‘anarchists’ intent on ‘blowing up the world’, blank evil men who seem to have no purpose, no intent, no life. Yet to be really evil, you first have to be really good, and these blubbering imbeciles, almost all of whom cannot aim a rifle, are just not convincing at all. In fact, they’re all quite miserable as well as incompetent. And the dialogue? Oh, boy. If you count these cossetted film stars spouting platitudes about the value of individual human life, peering at times self-righteous or misty-eyed into the camera, ‘dialogue’, then please do. The plot? Confusing, made more so by various dream sequences that one discovers too late are not real. Henry Cavill? He tries to hide his brooding Superman-ness behind some stubble and a moustache, but his sullen millennialism bubbles through, and he himself comes across as stilted as three-month old cheese. We feel neither any camaraderie nor visceral animosity between him and Cruise. The IMF? (Yes, the ‘Impossible Mission Force’, but I can’t help but think of the International Monetary Fund when I hear that acronym). They are showing their age, and this rag-tag bunch of middle-aged men would not be my first choice to save the world. I suppose it is good that Ethan Hunt, Tom Cruise’s alter ego, seems to live as a celibate, (just like GI Joe, all of which figures had ‘smooth’ (that is to say no) private parts). It seems Tom/Ethan had to give up his wife to ensure her safety (there’s a bit of an evangelizing nugget) but it seems rather cuckolding, to say nothing of immoral, for him to see her ‘happily’ married to someone else. I could go on, but why, when the film itself ceases to wonder about any of this? There are no gadgets, not much drama, much ado about nothing, really, except Tom Cruise running, jumping, fighting, flying, being earnest, being reckless, doing, well, the impossible, who does save the world, but apparently making it all up as the whole wobbly train trundles along. Ah, well, one takes what one can get in modern cinema, whose metaphysics are of birdbath depth, if they exist at all. With what may I conclude? The montages in this no-money-shot-too-big extravaganza offer some visual stimulation and entertainment, bringing my old GI Joe memories to life, but can we try, just try, to string together an actual engaging film from them?